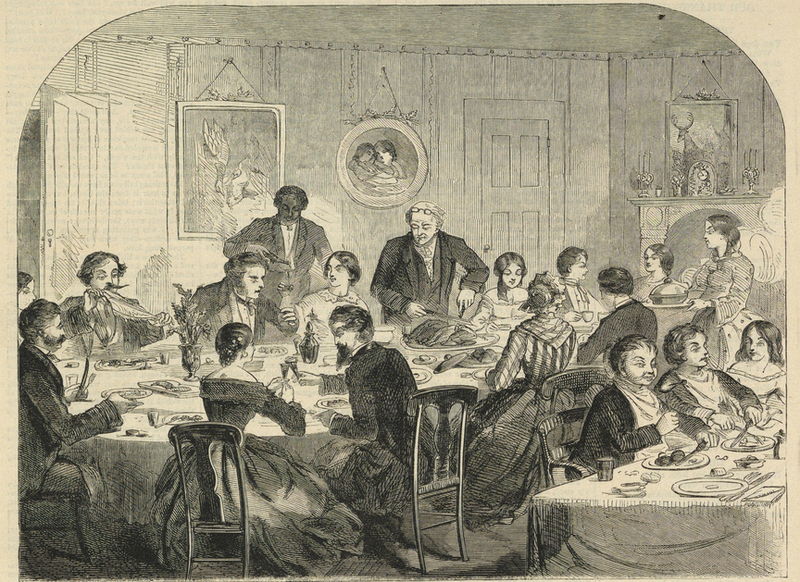 “Thanksgiving Day—The Dinner,” illustration by American artist Winslow Homer (1836–1910) for the November 1858 issue of Harper's Weekly. The weather has lately been very cold, and there is now snow enough to make some sleighing. I keep excellent fires, and do not stir from them, unless when it is absolutely necessary. I wish that I could be at home to Thanksgiving, as I really think that your puddings and pies and turkeys are superior to anybody’s else. But the term does not close till about the first of January. This is Thanksgiving Day—a good old festival; and my wife and I have kept it with our hearts, and besides have made good cheer upon our turkey, and pudding, and pies, and custards, although none sat at our board but our two selves. There was a new and livelier sense, I think, that we have at last found a home, and that a new family has been gathered since the last Thanksgiving Day. Thanksgiving was a big deal in New England in Hawthorne’s day. In her 2001 book, The Salem World of Nathaniel Hawthorne, Margaret B. Moore notes that only the Fourth of July approached the grandeur of the Thanksgiving festival, which in Hawthorne’s hometown was a weeklong celebration. On the evening of Thanksgiving day, John Inglefield, the blacksmith, sat in his elbow-chair, among those who had been keeping festival at his board. . . . If you don't see the full selection below, click here (PDF) or click here (Google Docs) to read it—free!